Tuesday, November 4, 2008. History was made. The immediate impact is tremendous, etched on the faces of millions as they watched the results and listened to the speeches. The longer-term impact has yet to be written. While we can’t accurately predict the next four years, we can assess the speeches from election night. Both Barack Obama and John McCain received praise for their performances. Watch the speeches, and then read the analysis from many sources. A movement in American politics hostile to the possession and the possibility of words-it had repeatedly disparaged Barack Obama as “just a person of words” — was not only defeated but embarrassed by a victory speech eloquent in echo, allusion, and counterpoint. No doubt many of us would have watched in tears if President-elect Obama had only thanked his campaign staff and shuffled off to bed; but his midnight address was written in a language with roots, and stirred in his audience a correspondingly deep emotion. Nick Morgan praised the election night speeches from both John McCain and Barack Obama. The best thing about Obama’s speeches so far is that they are not about him, but rather about the audience. That is almost unheard-of for a politician, and rare for any speaker. Therein lies his oratorical genius. This is the kind of speech that will be memorized in classrooms: powerful, positive, honest, direct, persuasive and emotionally engaging. Barack Obama gave a once in a decade speech in accepting the Presidency. He has an incredible ability to move people with oratory in both his behavior and content – and he took advantage of that when he had his most important audience of perhaps hundreds of millions of people across the world. John McCain gave his best speech. McCain seemed more relaxed and more in tune with his speech last night. 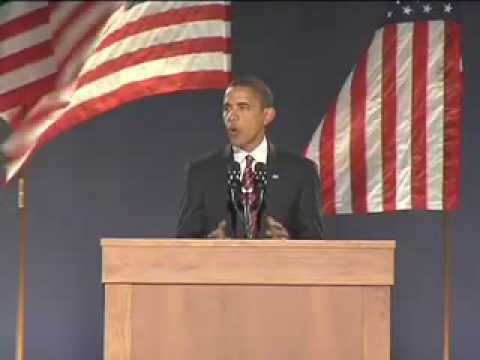 He seemed more comfortable with the words and rarely struggled with the teleprompter. Although he did lose his rhythm a few times, the timing of his words was far better than it has been in the past. Obama’s speech […] moved through time and biography to the present day. His speech has echo’s of Lincoln and Martin Luther King. A lesser speaker (say, oh I don’t know, the current President and Republican nominees for President and Vice-President) would not have been able to carry this off. Olivia Mitchell extracts six lessons in public speaking from Barack Obama. Envelop your point in a story. Paint pictures on the canvas of your audience’s mind. Over the entire campaign, there were six main communications categories both candidates had to deal with. Positive message about their own candidacy. Contrast/negative message about their opponent. Defending negative messages from their opponents. Quick reaction to opponent’s blunders. Adaptation of messages to shifting macro-political climate. How about you? What were your impressions of the speeches from President-Elect Obama and Senator McCain? 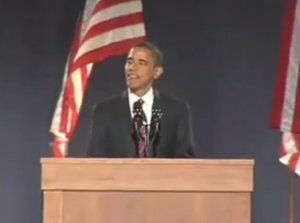 Here's the video, full text and a detailed analysis of the speech Barack Obama made in Chicago on the day of his being elected to the post of President of the USA, Wednesday 5th November, 2008. If there is anyone out there who still doubts that America is a place where all things are possible; who still wonders if the dream of our founders is alive in our time; who still questions the power of our democracy, tonight is your answer. Rousing first paragraph, referencing America (a power word in the USA) and the American Dream. ('dream' also echoes Martin Luther King's speech). Anchoring it across time: the past with 'our founders', the general present 'our time' and immediate present 'tonight'. 'Tonight' is a recurring theme, he goes off on a topic then returns to 'tonight', bringing it back to the people there and all those watching. Final word: 'Answer', beginning next triple and giving closure of solution. Its the answer told by lines that stretched around schools and churches in numbers this nation has never seen; by people who waited three hours and four hours, many for the very first time in their lives, because they believed that this time must be different; that their voice could be that difference. 'Answer' again: implying promise that Obama will solve problems. Referencing schools and churches: 'good' places from which good feelings can be borrowed. Momentous change, excitement of new times: 'lines that stretched...', 'numbers...never seen', 'first time in their lives', 'different'. Final word: Difference - echoing theme of change. Its the answer spoken by young and old, rich and poor, Democrat and Republican, black, white, Latino, Asian, Native American, gay, straight, disabled and not disabled - Americans who sent a message to the world that we have never been just a collection of individuals or just a collection of Red States and Blue States: we are, and always will be, the United States of America. Third 'answer' of triple. Inclusion: reference to diverse segments. Then bringing them together as 'Americans', in 'red and blue states'. Final words: USA - evoking feel-good patriotism. It's the answer that led those who have been told for so long by so many to be cynical, and fearful, and doubtful of what we can achieve to put their hands on the arc of history and bend it once more toward the hope of a better day. Extended triple - fourth 'answer' - hammering it home. Beginning the bad stuff: cynical/fearful. More momentous change: 'hands on the arc of history'. Final words: 'better day', evoking feel-good and hope (and healing the bad stuff). It's been a long time coming, but tonight, because of what we did on this day, in this election, at this defining moment, change has come to America. Time again, anchoring into now. A little bit earlier this evening I just received a very gracious call from Senator McCain. Senator McCain fought long and hard in this campaign, and he's fought even longer and harder for the country he loves. He has endured sacrifices for America that most of us cannot begin to imagine, and we are better off for the service rendered by this brave and selfless leader. I congratulate him, I congratulate Governor Palin for all they have achieved, and I look forward to working with them to renew this nations promise in the months ahead. Showing magnanimity in victory. Praising the defeated, not ignoring or trampling on him. Thus showing signs of being a great leader. Interestingly, praising the competitor before friends. Final words 'months ahead' - looking to the future. I want to thank my partner in this journey, a man who campaigned from his heart and spoke for the men and women he grew up with on the streets of Scranton and rode with on that train home to Delaware, the Vice President-elect of the United States, Joe Biden. Starting a sequence of thanks. Painting the VP as an ordinary man. Saying 'we're just like you' to connect with the audience. Creating tension by not naming the person until the end. I would not be standing here tonight without the unyielding support of my best friend for the last sixteen years, the rock of our family and the love of my life, our nation's next First Lady, Michelle Obama. Sasha and Malia, I love you both more than you can imagine, and you have earned the new puppy that's coming with us to the White House. And while she's no longer with us, I know my grandmother is watching, along with the family that made me who I am. I miss them tonight. I know that my debt to them is beyond measure. To my sister Maya and sister Alma and all my other brothers and sisters. Thank you so much for all the support you have given me. I am grateful tonight. Thanking the family. Showing himself as an normal family man (just like you). Mentioning the grandmother who just died but without being maudlin, and thus evoking sympathy. Final words: 'grateful tonight'. Showing humility. To my campaign manager David Plouffe, the unsung hero of this campaign, who built the best political campaign, I think, in the history of United States of America. To my chief strategist, David Axelrod, who's been a partner to me every step of the way. to the best campaign team ever assembled in the history of politics - you made this happen, and I am forever grateful for what you sacrificed to get it done. Thanking the team. Mentioning sacrifice, with prescience of paragraphs to come. Final words: 'get it done'. A man of action. But above all, I will never forget who this victory truly belongs to - it belongs to you. It belongs to you. I was never the likeliest candidate for this office. We didn't start with much money or many endorsements. Our campaign was not hatched in the halls of Washington - it began in the backyards of Des Moines and the living rooms of Concord and the front porches of Charleston. 'Belongs to you', repeated. Bringing the audience in. Instead of going to them, Obama is now bringing them to him, showing how they have been his campaign managers (and so must continue to support him). Alliteration: Hatched in halls' and 'Began in backyards'. Final words: 'porches of Charleston'. Connecting everywhere with the president. Creating a vector. It was built by working men and women who dug into what little savings they had to give five dollars and ten dollars and twenty dollars to the cause. It grew strength from the young people who rejected the myth of their generation's apathy; who left their homes and their families for jobs that offered little pay and less sleep; It drew strength from the not-so-young people who braved the bitter cold and scorching heat to knock on the doors of perfect strangers; from the millions of Americans who volunteered, and organized, and proved that more than two centuries later, a government of the people, by the people and for the people has not perished from the Earth. This is your victory. Triple: 'dollars'. Showing how great things come from small actions and hence encouraging future mass contribution. Evidence of change: Visceral painting of a new generation of activists, along with an awoken older generation, supporting the cause through thick and thin. Triple: of/by/for people - evoking Gettysberg address, connecting with the past and the American way. 'perished from the Earth' - powerful evocation. Final words: 'your victory'. Feel-good, but also chaining them. Your victory today is your responsibility tomorrow. I know you didn't do this just to win an election and I know you didn't do it for me. You did it because you understand the enormity of the task that lies ahead. For even as we celebrate tonight, we know the challenges that tomorrow will bring are the greatest of our lifetime - two wars, a planet in peril, the worst financial crisis in a century. Even as we stand here tonight, we know there are brave Americans waking up in the deserts of Iraq and the mountains of Afghanistan to risk their lives for us. There are mothers and fathers who will lie awake after their children fall asleep and wonder how they'll make the mortgage, or pay their doctors bills, or save enough for their child's college education. There is new energy to harness and new jobs to be created; new schools to build and threats to meet, alliances to repair. Now getting to the tough stuff (and showing leadership by not shying away). 'task that lies ahead' initially vague about it. Then becoming more specific with triple of wars, planet and financial crisis. Linking emotion of feelgood tonight with 'brave Americans', connecting audience with pride and war. Showing the common touch, highlighting financial crisis with concern for family financial issues. Little illustration of environmental issue. Is this of lower priority? Triple on hope: new energy/jobs/schools. Final words: 'alliances to repair'. Signalling sea change in foreign policy. The road ahead will be long. Our climb will be steep. We may not get there in one year or even one term, but America - I have never been more hopeful than I am tonight that we will get there. I promise you - we as a people will get there. 'Road' metaphor provides visual platform. 'But' refutes the difficulty with 'America' god word, then sliding into hope and anchoring it into 'tonight' here and now. Making an inclusive promise, making a commitment for everyone. Final words: 'we as a people will get there', showing inclusive determination. There will be setbacks and false starts. There are many who won't agree with every decision or policy I make as President, and we know that government can't solve every problem. But I will always be honest with you about the challenges we face. I will listen to you, especially when we disagree. And above all, I will ask you join in the work of remaking this nation the only way its been done in America for two-hundred and twenty-one years - block by block, brick by brick, calloused hand by calloused hand. 'false starts' - echoes road metaphor. Hidden triple about problems: setbacks, won't agree, can't solve. Hinting at unpopular decisions that Obama may have to make, then linking it to honesty and listening. Building the picture of integrity in presidency. Inclusion again: involving the people in the change. Final words: 'calloused hand by calloused hand'. Calling on history and casing the working person as hero. What began twenty-one months ago in the depths of winter must not end on this autumn night. This victory alone is not the change we seek - it is only the chance for us to make that change. And that cannot happen if we go back to the way things were. It cannot happen without you. Without a new spirit of service. Without a new spirit of sacrifice. Anchoring dynamic in the past and projecting it past tonight, through feelgood victory to substantive change. Including the people again. Hammering home 'it's your job too', but making it a glorious endeavor. Final words: 'a new spirit of sacrifice'. Offering glory and being part of something great in return for personal effort and privation. So let us summon a new spirit of patriotism; of service and responsibility where each of us resolves to pitch in and work harder and look after not only ourselves, but each other. Let us remember that if this financial crisis taught us anything, it's that we cannot have a thriving Wall Street while Main Street suffers - in this country, we rise or fall as one nation; as one people. Clarifying the deal: work hard and feel good. Embrace the ideal of the collective. Recognition of a recent concern and highlighting inequality in Wall Street excess. Hinting of possible action there. Let us resist the temptation to fall back on the same partisanship and pettiness and immaturity that has poisoned our politics for so long. Let us remember that it was a man from this state who first carried the banner of the Republican Party to the White House - a party founded on the values of self-reliance, individual liberty, and national unity. Those are values we all share, and while the Democratic Party has won a great victory tonight, we do so with a measure of humility and determination to heal the divides that have held back our progress. As Lincoln said to a nation far more divided than ours, We are not enemies, but friends...though passion may have strained it must not break our bonds of affection. And to those Americans whose support I have yet to earn - I may not have won your vote, but I hear your voices, I need your help, and I will be your President too. Burning bridges: reminder not to 'bad old days'. Implication that we are now past this. Alliteration: partisanship and pettiness, poisoned our Politics. Inclusion: showing that Republicans share the same basic values. Thus speaking to all Republican voters. Integrity: Repeating magnanimity and call for humility and healing. Triple: humility, heal, held back. History: Evocation of Lincoln in support of unity argument. Final words: 'I will be your President too.' Dragging Republicans into the fold. Of course he is their president, but he is calling them into the emotional fold. And to all those watching tonight from beyond our shores, from parliaments and palaces to those who are huddled around radios in the forgotten corners of our world - our stories are singular, but our destiny is shared, and a new dawn of American leadership is at hand. To those who would tear this world down - we will defeat you. To those who seek peace and security - we support you. And to all those who have wondered if Americas beacon still burns as bright - tonight we proved once more that the true strength of our nation comes not from our the might of our arms or the scale of our wealth, but from the enduring power of our ideals: democracy, liberty, opportunity, and unyielding hope. Statesman: addressing foreigners. Addressing the individual with visceral words: 'huddled', 'forgotten corners'. It's a bit condescending, confirming American belief in their superiority. Not spending too much time on the bad guys. Just 'we will defeat you'. Returning to 'tonight' theme. 'We proved' showing what can be done is based on belief. Final words: A whole string of god words: wealth, power, democracy, liberty, opportunity, hope. For that is the true genius of America - that America can change. Our union can be perfected. And what we have already achieved gives us hope for what we can and must achieve tomorrow. Casting America and Americans as genius and hence capable of many things. Evocation of hope in achievements past. Final words: 'must achieve tomorrow'. Confirming the necessity of what must be done. This election had many firsts and many stories that will be told for generations. But one that's on my mind tonight is about a woman who cast her ballot in Atlanta. She's a lot like the millions of others who stood in line to make their voice heard in this election except for one thing - Ann Nixon Cooper is 106 years old. Creating a sense of history. Personalising. Reducing the masses to one person, 'making voice heard'. Final words: '106 years old', making the ordinary extraordinary. She was born just a generation past slavery; a time when there were no cars on the road or planes in the sky; when someone like her couldn't vote for two reasons - because she was a woman and because of the color of her skin. Using Ann Nixon Cooper's life to re-paint history. Triple: no cars, no plane, no votes. Bringing in the history of skin color (and so making a self-reference). And tonight, I think about all that she's seen throughout her century in America - the heartache and the hope; the struggle and the progress; the times we were told that we can't, and the people who pressed on with that American creed: Yes we can. Triple: heartache/hope, struggle/progress, times told. Showing historical struggle, connecting the audience again with it. Final words: Starting the final theme of 'yes we can'. This is repeated at the end the next five paragraphs. At a time when women's voices were silenced and their hopes dismissed, she lived to see them stand up and speak out and reach for the ballot. Yes we can. Assonance in 's' sound. Response to despair with hope and determination. When there was despair in the dust bowl and depression across the land, she saw a nation conquer fear itself with a New Deal, new jobs and a new sense of common purpose. Yes we can. Assonance in 'd' sound. Alliteration in despair, dust, depression. Triple: new. Evoking a sense of rebirth. When the bombs fell on our harbor and tyranny threatened the world, she was there to witness a generation rise to greatness and a democracy was saved. Yes we can. History of oppression and heroic response, saving not just the day but the whole of democracy (and hence all that is good). She was there for the buses in Montgomery, the hoses in Birmingham, a bridge in Selma, and a preacher from Atlanta who told a people that We Shall Overcome. Yes we can. Evocation of the Selma to Mongomery human rights march and Martin Luther King, the 'preacher from Atlanta'. A man touched down on the moon, a wall came down in Berlin, a world was connected by our own science and imagination. And this year, in this election, she touched her finger to a screen, and cast her vote, because after 106 years in America, through the best of times and the darkest of hours, she knows how America can change. Yes we can. Touching on the moon landing (a proud American moment) and the symbolic fall of communism (and implied victory of capitalism). Connecting then the old lady with modern technology, stitching history into the presidential vote and the mandate for change. America, we have come so far. We have seen so much. But there is so much more to do. So tonight, let us ask ourselves - if our children should live to see the next century; if my daughters should be so lucky to live as long as Ann Nixon Cooper, what change will they see? What progress will we have made? 'America' - addressing the nation with easy familiarity. Triple: so far, so much, more to do. Linking history into the future again. Individual touch: connecting his daughters with the old lady. This is our chance to answer that call. This is our moment. This is our time - to put our people back to work and open doors of opportunity for our kids; to restore prosperity and promote the cause of peace; to reclaim the American Dream and reaffirm that fundamental truth - that out of many, we are one; that while we breathe, we hope, and where we are met with cynicism, and doubt, and those who tell us that we can't, we will respond with that timeless creed that sums up the spirit of a people: Triple: This is. The final call to action of the speech. Return to theme of hope and positive benefits. Restoration triple: restore, reclaim, reaffirm. Unifying assertion: 'out of many, we are one'. Explicit evocation of the American Dream. Yes We Can. Thank you, God bless you, and may God Bless the United States of America. Restating the 'yes we can' theme. Traditional final blessing, almost as a priest of the new order. The overall approach is to create an inclusive sense of history where individuals make personal sacrifice in order to be a part of a great revival. The history as told includes the longer American history but with particular leverage on African American history, where poverty was and is well known, and where struggles in living memory led to significant change.